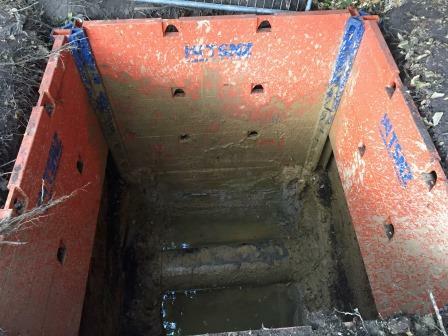 Fresh off the boat from Germany, the new TSNZ Multibox was snapped up by C W Glasgow for a difficult to access new stormwater line running along the back of private properties. The Multibox system is ideal, being a modular box with 600mm deep panels in 2m, 2.5m and 3m lengths. Panels are pinned to the corner sections, making it easy to create gaps for pipes and services. TSNZ has corner rails in 1.8m and 2.4m lengths. Should extra depth be required 2 x 1.8m rails can be used to achive a depth of 3.6m. In this job bottom panels were left out of two sides to allow the PE pipe to run though underneath. The system is able to be assembled with very small excavators as components are light weight steel. Panels have a slim 60mm profile. By using different panel lengths a variety of shapes and sizes can be formed. Are you at risk of breaching them?